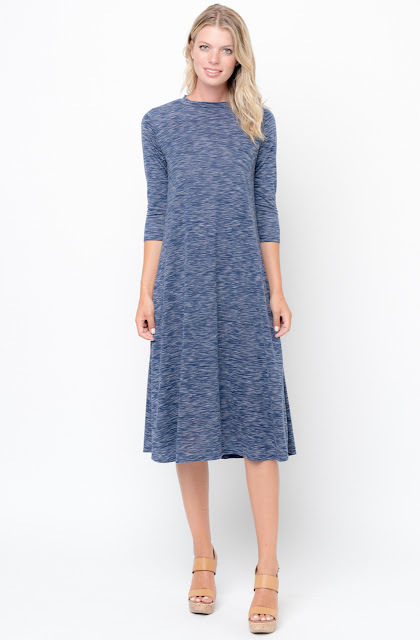 Essential heathered midi dress from our staple + exclusive collection, made in a soft + stretchy knit. Cut in a flattering A-line + leg-lengthening silhouette below-the-knee, featuring a banded crew neck and fitted 3/4 sleeves. Size + Fit: Small (0-4), Medium (6-8), Large (10-12), X-Large (14-16). Model is wearing a size Small + 5'9". Length: 45". Polyester, Rayon, Spandex. USA. Caralase – Womens Clothing Online Store in USA. Shop latest trends apparels from our wide range of Maxi skirt, Maxi dresses, Sweaters, Maxis, Tops, Skirts, Shorts, Jampers, Coats, Pullovers, Cardigans, Sweaters, Outwears, Jumpsuits, Bottoms, and more at best prices.